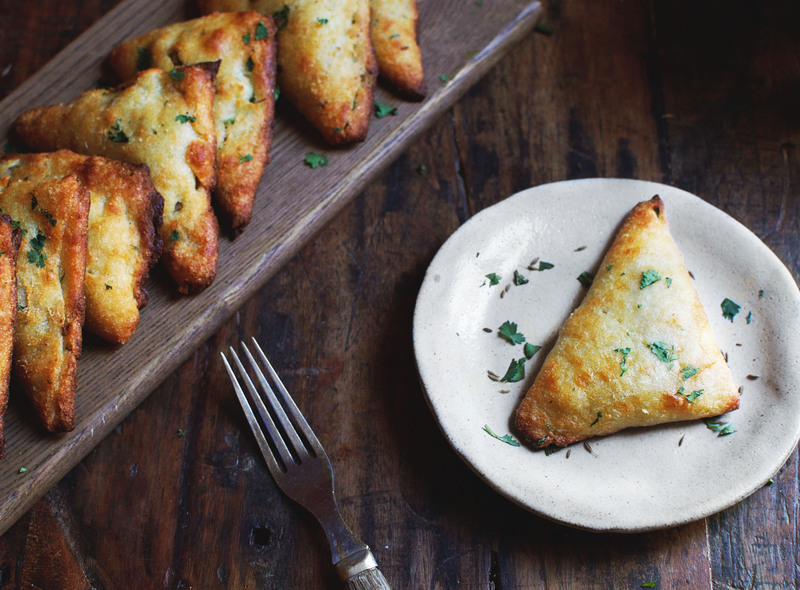 These Low-Carb Indian Vegetable Samosas are baked instead of fried. These recipe can be part of low-carb, gluten-free, ketogenic, diabetic, Atkins, and Banting diets. One of my favorite foods at Indian restaurants is the vegetable samosas. Unfortunately, the traditional wrapper and potato filling make them off limits for a low-carb diet. I love them so much that I had experiment a bit in my own kitchen to make a low-carb version. 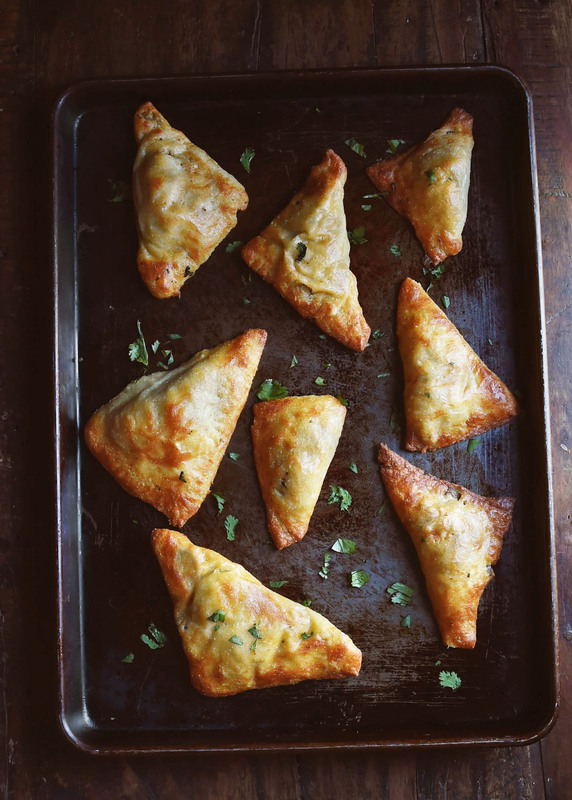 These samosas are triangular packets of spicy goodness. 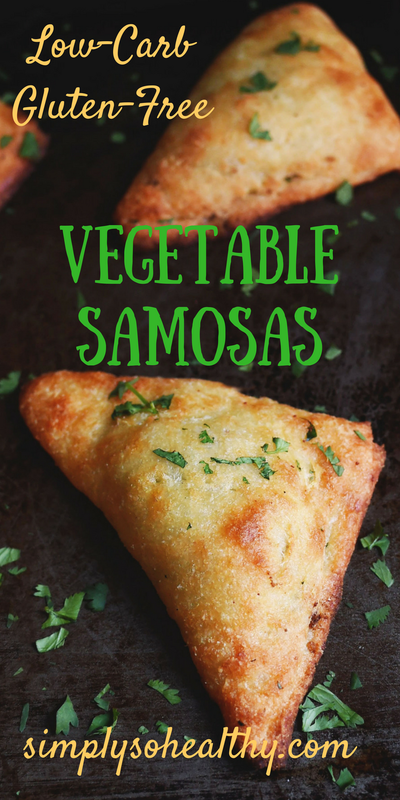 The filling for these Low-Carb Indian Vegetable Samosas has a base of minced cauliflower and onions. This combination is spiced up with aromatic spices like cumin, garam masala, fresh ginger, and cilantro. A bit of red chili flakes adds a bit of heat. The cauliflower base picks up all of these intense spicy flavors and even cauliflower haters won’t know it’s there. Our spicy vegetable filling is wrapped in a dough made from mozzarella cheese and almond flour. This dough is lightly scented with cumin. Mozzarella dough makes a satisfying pastry that bakes to a golden brown with crisp edges. Even though mozzarella is a main ingredient, the dough doesn’t taste cheesy at all. In fact, mozzarella dough is so tasty and versatile that it is one of my favorite doughs to use in low-carb cooking. 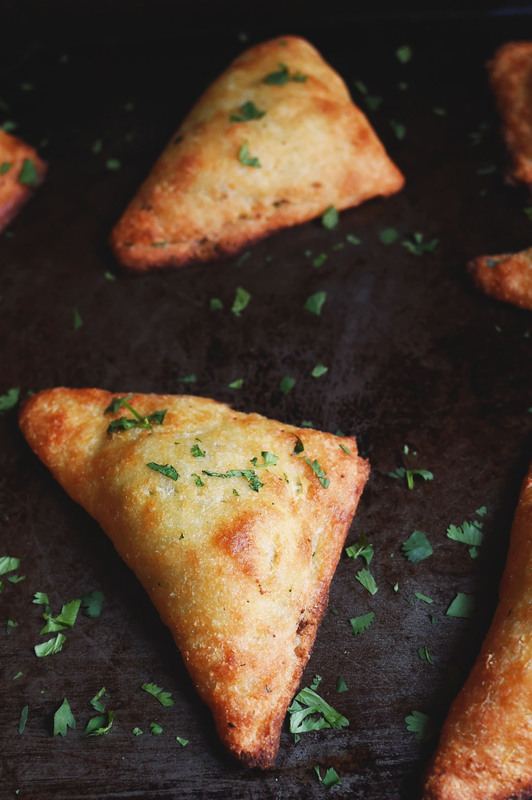 Samosas are typically served as an appetizer, and while these make a great appetizer, they also make a great main course for lunch or dinner. Serve them with a salad to complete a low-carb meal. Enjoy! Preheat a large skillet over medium heat. Add butter. When butter has melted and stopped foaming, add the cauliflower and onions. Sprinkle the salt over the vegetables. Cook, stirring occasionally, until the edges have started to brown and the vegetables are cooked through. Stir in ginger root, coriander, garam masala, ground cumin, cumin seeds, and chili flakes. Stir for 1-2 minutes to allow the spices to toast. Turn off the heat. Stir in the cilantro. Taste and adjust seasoning. Add salt to taste. Preheat oven to 375º Fahrenheit. Have a rolling pin, 2 pieces of parchment, and a baking sheet available. Set up a double boiler. I use a large sauce pan with about 1 1/2-2 inches of water in it and a medium mixing bowl that fits on top. Bring the water in the lower part of the double boiler to a simmer over high heat. Once it is simmering, turn heat to low. Meanwhile, place the almond flour, cumin, salt, and mozzarella in the top part of the double boiler. Stir together. Place the bowl containing the almond flour mixture over the simmering water. Be careful not to burn yourself with the hot bowl or with steam escaping. I use a silicone mitten to hold the bowl. Stirring the mixture constantly, heat until the mozzarella cheese melts and the mixture forms a dough. Turn the dough out onto one of the pieces of parchment and knead a few times to equally distribute the ingredients. Shape the dough into a thick rectangle and cover with the second sheet of parchment. Roll dough into a rectangle about 8 inches wide by 16 inches long. Cut the dough rectangle in half lengthwise, then in half cross-wise. Then cut each of the four sections in half crosswise to form 8 four inch squares. Spoon the filling onto the center of each square, dividing it equally among the squares. Fold the squares on the diagonal to form triangles and pinch the edges closed. Place one of the pieces of parchment used to roll out the dough onto a baking sheet, then place the samosas on the sheet. Make fork holes in each samosa to provide a place for steam to release. Bake for 14-17 minutes or until golden brown. These sounds amazing, especially the filling!! Will be trying them soon. I have only tested this recipe using almond flour. You could try using coconut flour, but you would need to use less as coconut flour acts very differently than almond flour. It may take a few batches to get it right. 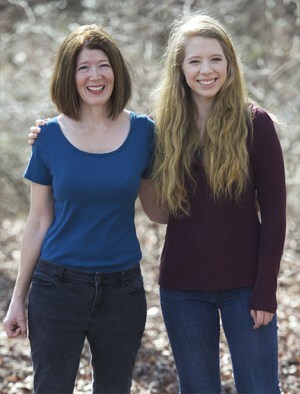 I would love to experiment more with coconut flour, but Harper has an allergy to coconut, so I don’t use it very often. Good luck! I used 1/3 cup coconut flour plus the 1/4 coconut flour. They were so delicious!!! Thanks so much for sharing! I’m glad they worked out with your coconut flour substitution! You could experiment with a combination of flours; tapioca, coconut, flax. I dislike the strong flavours of any of the low carb flours so I use a combination for most of my cooking. Ps – Annissa, sounds absolutely delicious. Can’t wait to try. Thanks so much for taking the time to comment! I hope you enjoy the samosas! What a great low carb idea! Can’t wait t use this to add some variety to my low carb lifestyle. Thanks! Thanks so much! We love to create variety. These are AMAZING!! Even my husband, who is not a fan of cauliflower or eating low-carb loved them! I heated the cheese and almond flour together in the microwave to save time (I’ve made similar dough this way before). I’m so glad you and your husband liked them! I know a lot of other people who use the microwave method. I don’t have a microwave so I use a double boiler. 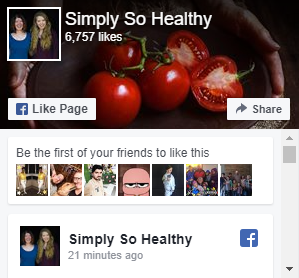 Thanks so much for taking the time to rate the recipe and give us your feedback! How do you do it in the microwave? How do you do the microwave version? Instead of using the double boiler, you can put it in a microwave-safe bowl, then microwave it for 30 seconds at a time, stirring in between. I’m going on a hiking holiday and was wondering how many days these samosas stay fresh? I’ll put them in my daypack. I store these in an airtight container in my refrigerator and try to use them before they are three days old. I would worry about them spoiling quickly in a warm daypack. One of my favorite recipes for road trips is my Grain-Free Chocolate Donuts. I don’t worry about them spoiling as quickly. My Curry-Crusted Pecans would also make a good option. I hope you have a great hike! Pack frozen ones! They’re great for meals on days 2-3 of hike, and can help keep things cool too. You’re welcome! I hope you enjoy them! Can these be made the day before and then baked before guests arrive? I’ve never tried doing this with this type of dough. The filling would be fine to make ahead and refrigerate overnight in a covered container. You could then make the dough and assemble them before guests arrive. I don’t know how well they would work if you made the dough and assembled them the day before. If you try it, let me know how it works! Do you think there are any substitutions for the cheese that are worth experimenting with? I can’t do any dairy. Thanks so much! I don’t think this recipe would work without the cheese. I know that a lot of people are sensitive to dairy and it would be worth working on an alternative dough that would hold up to fillings. I’ll try to come up with something in the future. Hi. Would it be ok to use regular mozzarella and not part skim for this? Or would that make it too oily? The only reason I use part skim mozzarella is because it’s a bit stretchier due to the higher protein content. If it’s a fairly stretchy regular mozzarella, it shouldn’t be an issue. I would not use fresh mozzarella. Good luck! Thanks so much for your feedback! I’m glad you enjoyed them! Can these be deep fried instead of baking? I haven’t tried deep frying this type of dough, so I don’t know how it would turn out. Good luck! Wow! I have to give these 5 stars and more if I could. So incredibly good. I’d swear they had meat in them if I didn’t know better. I’ll definitely making these again. I think these are heavenly. My problem was not having enough dough for the amount of filing. I plan on leaving the filling the same and doubling the amount of dough. I plan on adding some sour cream or heavy cream to the dough as well. It was too crumbly. I’m glad you enjoyed the samosas! I don’t remember having issues with there being too much filling. It seems like something may have happened that made the dough not stretchy enough to roll out thinly. The texture of this dough can vary a bit depending on the brand of cheese and the humidity in the air. I usually use a part-skim mozzarella because it has a higher proportion of protein and it is the protein that makes it stretchy. Be sure to heat the dough long enough for the mozzarella to melt and then work while the dough is hot–just cool enough that you don’t burn your fingers. I hope these suggestions help! Made these tonight and they were surprisingly easy and quick to come together! AMAZING flavor, and I made a mint-coriander chutney to go with them. 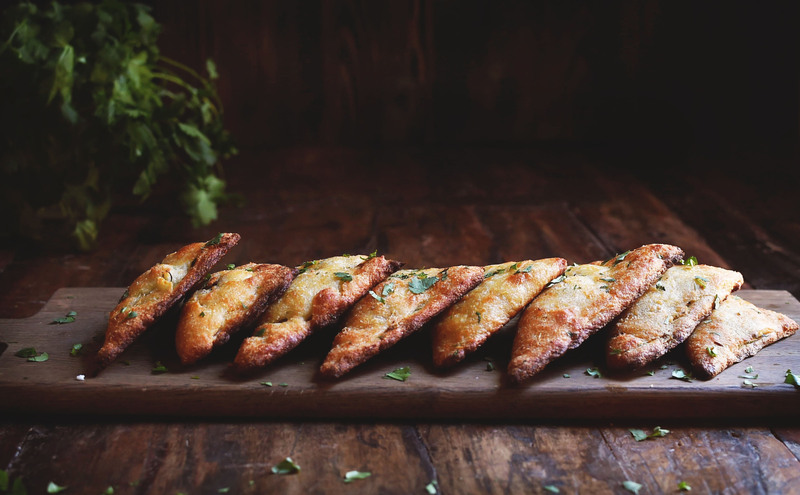 Definitely keeping this recipe as a go-to — may even make them mini as appetizers for parties. Even non-low carb foodies would love these — they were so delish!! Mint Coriander chutney sounds like an amazing condiment with them! Glad you enjoyed them! I haven’t tried freezing them. I don’t see why it wouldn’t work. They never last long enough in my house to make it in the freezer. Lol! Could the low carb dough be made using garbanzo flour? Or does it not have the right properties? It has been a while since I’ve used garbanzo flour. I think it will work, but you may need to adjust the amount slightly. I haven’t tried it so I don’t know for sure. Good luck! These made my entire family so happy! I just had a little trouble getting the dough to stick to itself, but they turned out beautiful overall. I served them with plain yogurt. Thank you for the recipe! You’re welcome! I love the idea of serving them with yogurt. What a perfect combination! I’m new to mozzarella doughs and found this one a little difficult to work with. I used the microwave method to melt the cheese, then stirred in the remaining ingredients. However I couldn’t quite get my dough rolled out to an 8×16 triangle, and I couldn’t get the edges to stick together when pinching to form the samosa. I reheated the individual squares for a few seconds in the microwave and made it work, but I suspect that the additional microwave time affected the texture of the dough. Any suggestions for a newbie? Either way, this was a solid recipe! The finished product was delicious. My husband and I both agreed we will be making these again. I served with an Indian green chutney. Mozzarella dough is just like anything else, the more you make it, the better you get at it. It may take some time to get used to working with it. I don’t use the microwave method, but some of my followers do and my be able to advise you. Thanks for your feedback, and I’m glad you enjoyed the final product! Had a hard time sealing the edges. Any tips? Try to keep the filling away from the edges. Any sort of oil will keep them from sealing. You could try painting a bit of beaten egg on the edges before closing, then using a fork to push the two sides together. Good luck! Thank you so much! These samosas are fabulous! My husband was starting to believe that nothing Paleo could ever be tasty, until he tried these. I made a recipe with tapioca flower a few days ago, and read after that tapioca isn’t healthy and not suitable for diabetics. Yours came out better than that recipe, way better, and it’s healthy! I’m so glad they worked out for you! If you like Indian food, you may want to check out the chicken tikka masala recipe as well. I would like to try this. Cannot wait. I just had puri for pani puri -deep fried. Looking for healthy version of pani puri puri recipe. Any suggestion? Honestly, I’ve never eaten it, but maybe someone else will be able to help.